Rustic Barns and Sheds is proud to offer a variety of buildings to meet your storage needs. We offer vinyl cottage garages, vinyl cottage sheds, and of course our "original" rustic barn. At Rustic Barns and Sheds, we know that quality is a number one priority. This is why we use premium building materials so your project not only looks good, but lasts for years to come. 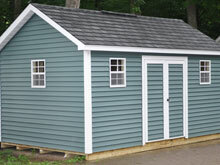 We offer a complete line of sheds that are ready for delivery or we can custom build a shed to meet your requirements. We do all of our own work from start to finish so there are absolutely no surprises. At Rustic Barns and Sheds, we make your project a priority from start to finish regardless of size. Delivery is available at a reasonable cost. Please take a moment to browse our site and get a better idea of exactly what we offer. Feel free to contact John at 814-695-1499 with any questions you have regarding our products. All Images Copyright 2011-2017 Rustic Barns and Sheds & Good Sheds Cheap. Contact us at 814.695.1499. Website design by Falger Media.